"Great software to communicate with your colleagues"
Zoom.ai is a really wonderful software to help host meetings between colleagues who may be in different spaces, or invite different individuals to speak to our organization. It has a relatively easy set-up, and we have found it to be super manageable for those who may not able to physically come into the office to set up an account or just access the software with few to no issues in doing so. We've really enjoyed having access to it as an organization and utilizing its different features. We have had a few problems with the video portion of the calls, but this may be on part of the individual user, rather than the fault of Zoom itself. However, on the occasion it has occurred, it has been very stressful to the involved members due to the lack of other easy options to continue the call, other than just be on a voice-only call. Like I said, it helps with problems of different locations and sharing materials across these borders in order to help unite those who may be far away with those who are on location for us. In addition, it helps us collaborate with different materials, rather than having to email it out and have everyone open it in their own personal computer, it allows us to share the materials across calls. "Great software for communication, helps unite company"
Zoom.ai is a wonderful software! At our non-profit, we really value the ability for Zoom to help connect us with different individuals who can help us in relation to the variety of topics that we cover - essentially, it allows us to extend our network to quickly link up with experts who can debrief others on topics. It's a great way to avoid lengthy email chains that bog down your inbox. In addition, due to the amount of people that we have working remotely each day, even just those that are driving from one place to the other to help clients, it serves as an effective way to bring them in on different discussion and ensure that those people aren't missing any important topics that are being covered. We've had some problems with the video features freezing up or being a bit hard for our members to manage. Because we strive to have 50% refugee community representative at our non-profit, it's imperative that the software be HYPER user-friendly (as some of the individuals we hire have little to no computer experience - for some, even figuring out how to turn on the computer or open their email account is a challenge). Therefore, we've struggled with that, but it's understandable on the part of Zoom.ai that it would be difficult to be quite as user-friendly as our refugee community would need. I definitely recommend giving it a shot! It helps us connect the organization and keep in contact with experts and members who may be working off-site. We think it's a great software! "Want to make your professional life easier? This is the system to help you manage yourself!" We just started treating ourselves at work by using Zoom.ai and it's a dream. The system provides meeting scheduling, task management, travel planning, call briefings, and many other extremely helpful features. It's like having a personal assistant but the personal assistant is just AI working it's magic! Extremely helpful for the busy professional. My only concern would be security...a system having this much access to my accounts, etc. must be gathering data and I think it would wise of the company to have explicit communications with users on the security of their data. Project management, task management, time management, task delegation. "Zoom.ai - Management and Interaction at its best with Security"
Zoom.ai allow us to interact with team, clients and other end users. We can schedule meetings with different options for selecting our time slots as per the requirements. We can share documents that too with fully fledged security. Zoom.ai allows us to manage our task and share our queries and concern with other team members through chat support. Need bit work over friendly User interface so that different options can be selected while meeting/sharing documents. Like they can add Disable user video when there is any network unstablity. We share our valueable documents with clients and other members with full security. We scheduled our meeting with clients at far distance and share our views and queries and result in enhance our firm.productivity. "Zoom makes conference calls easy"
It’s so easy to schedule meetings (just start a meeting and send an invite link). Also love how easy it is to include multiple participants. Love the call record feature as well. Talking with multiple people at once, being able to easily connect without having to go through a cumbersome scheduling process or search for usernames. A great tool! Makes it easy to get things done around the office. Especially those big ticket items you're too lazy to do. I can't say there's anything I dislike. I didn't have the opportunity to do so so much for so long. Instead of going through the pain of hiring, and all the stress that comes with it. We're able to streamline things with zoom.ai. Zoom allowed us to hold a meeting with multiple different agencies and to train as if we were in the same room. There wasn’t anything about this program that didn’t suit what we needed for the meeting. The ability to integrate multiple agencies into a training without having to allow employees to leave and have to meet in one spot. Missing quite a few competitors for certain Industries. Do a trial run and see if it meets your needs. Finding candidates for open positions which results in placement fee revenues. "Time saver - totally made my life easier!" Increased efficiency. When you're a sales rep, on the road, scheduling and meeting customers, the last thing you want to do is to pull up your laptop and look up all the info needed. Zoom.ai saves that one step which is a huge time saver. It can be laggy sometimes but the benefits out-weights the downside way more. I was able to concentrate more on my day-to-day and it allows my manager to have accurate information because logging is so easy. "Great Automated Virtual Assistant Software"
"Easy to Use for Short-Stints"
"Good Ai assistant in slack"
I love who is feature. It can find a lot of useful information about people. 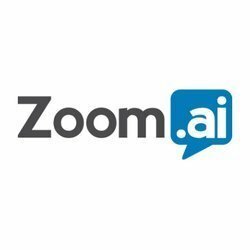 "Zoom.ai makes your life easier! " This product is great for people who need support managing their day-to-day schedule. Price per month is too high. I would be interesting in testing the full functionality of the platform, but can't commit to the monthly cost. The corporate option doesn't make sense for my team at this time. Increased efficiency, and allowed me to spend more time to focus on important tasks. It also decreases human error in scheduling, i felt much more organized and prepared for my week. "Difficult to learn to use"
Allows easier connectivity accross users. Difficult to learn to use- functions can be confusing. Zoom.ai is a chat-based productivity tool that helps my team save time. Productivity was opened up for us - helping us prep for meetings etc. and get better results on our team! nothing, it gets the job done and helps my team! it's a really innovative product. * We monitor all Zoom.ai reviews to prevent fraudulent reviews and keep review quality high. We do not post reviews by company employees or direct competitors. Validated reviews require the user to submit a screenshot of the product containing their user ID, in order to verify a user is an actual user of the product. Hi there! Are you looking to implement a solution like Zoom.ai?